Our Full Time Junior Golf Program integrates academics, golf, fitness, and mental training with personal development for children 10 to 18 years old. 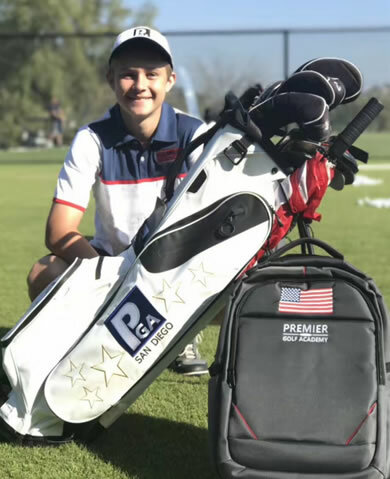 The Full-Time Junior Program at Premier Golf Academy is for juniors that want to be the best, train like the professionals, and prepare for college or professional golf careers. During the week, our Full-Time students have the unique advantage of attending our partner school, Tri-City Christian for their academic program, followed by spending the remaining portion of their day training with our highly skilled and experienced coaching team. On the weekends, students can join our traveling team for tournament competitions or spend the time playing and training at our facilities. 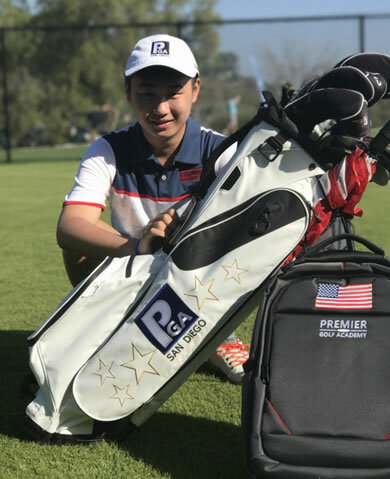 Premier Golf Academy’s location and environment enables us to offer uniquely valuable experiences to our students and to support them in their golf, personal, social, and intellectual lives. Our team members guide students to mastering their golf skills, acquiring knowledge, and thinking critically, creatively, and independently. Our goal is to help each student reach their potential and achieve all their dreams on and off the golf course. There is no better place and no better program for your child to prepare for the future. Juniors coming through our program have great success. Our students excel and win at every level from high school to university and professional golf. 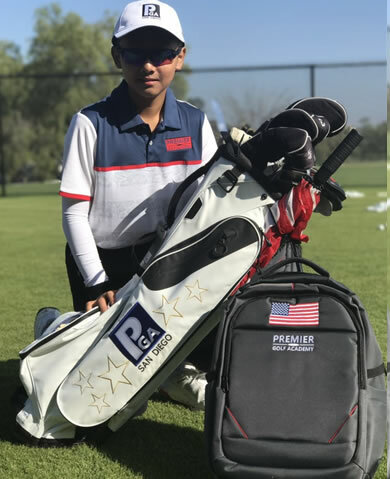 At Premier Golf Academy, we provide our students with the best coaches, facility, equipment, environment, and opportunities to maximize their performance and achieve their dreams. Our training programs address all aspects of the individual – technical, physical, mental, emotional, and spiritual. We believe the interaction between a coach, athlete, and parent is a very important relationship. When we are involved as a coach in an athlete's life, we are agreeing to build trust, care about their hardships, help them overcome challenges, and ultimately take an interest in them as a person as well as an athlete. Premier Golf Academy & Velocity Sports Performance in San Diego partnered to provide the most comprehensive Athletic and Performance Development system available. Premier Golf Academy students have complete access to their fully-integrated system of training, mindset, nutrition and recovery, both at Velocity Pro Training facility and onsite at Premier Golf Academy. Our students will gain a tremendous advantage in their path of development with this partnership. Tri-City Christian School is a private, college preparatory school located in Vista, California, just seven miles from Premier Golf Academy student housing. The school is a preschool to grade 12, college preparatory school with selective admissions. TCCS empowers students to realize their full potential through high-quality academics and student development programs that are grounded and culturally relevant while providing an attractive, safe campus environment conducive to learning and personal growth. With our talented faculty, strong leadership, use of technology, and high academic standards our students engage in their educational process, preparing them for the 21st century world. The best collegiate golf programs demand top tier student athletes. Our Full-Time Junior Program is structured to prepare students both academically and athletically to give them every opportunity to be successful. Students learning to balance the demands of academics and golf, play the game they love while meeting their educational responsibilities. Premier Golf Academy and Tri-City Christian Schools understand the challenges of becoming acclimated with the American school system. To further support our junior golfers, we have tutors available for English, SAT, ACT and Toefl and to help with any difficulties they encounter. Housing is one of the most important elements of attending a junior golf academy. Premier Golf Academy provides our students with a safe, secure, and caring environment that helps them feel at home. 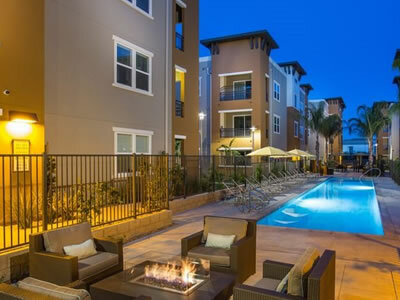 Students live in private, gated Luxury Condo’s just 10 minutes from the Academy and Tri-City School. 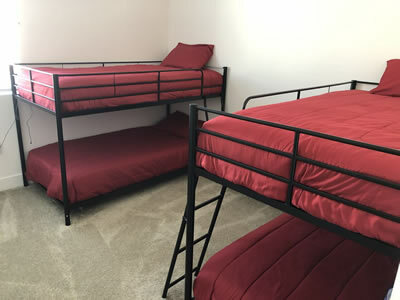 Students room with either one or two students with a maximum of four students per home. In addition, each home has a living room, dining room, full kitchen and laundry room, and a patio for relaxation and games. 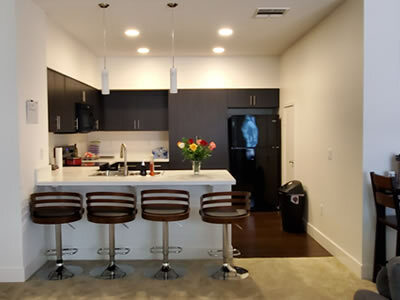 All units have wireless Internet access and cable television. Students receive guidance and supervision 24/7 by resident house parents who take on the responsibility of overseeing our students’ daily lives as well as assisting with their school commitments. Students interact closely with fellow students and their houseparent’s allowing for a fun and family-oriented environment. Premier Golf Academy College Planning & Placement has decades of experience finding the right college for students. This is a process that starts in the 7th grade planning our academic and athletic blueprint for success. We set monthly and yearly goals students are guided to achieving. Our University Planning & Placement program works with all full-time Academy students to create an individualized roadmap to reach their goal of studying and playing golf at the collegiate level. This is accomplished through college planning, athletic recruiting, SAT/ACT/TOEFL registration, academic support and NCAA compliance education. We work with our partner school to monitor student grades, make scheduling recommendations and send transcripts to colleges, coaches and to the NCAA. There are many components in choosing the right collegiate golf program and school. This is a big decision for students and their family, we will be involved and educate our students and their families throughout the process. See What Our Full Time Golf and School Program is Like! Our Full Time Program Experience is for junior golfers interested in joining our Full Time Junior Program. It gives you the chance to live, learn, and train alongside our Full Time Junior Golf students. Students will spend a day at our partner school Tri City, shadowing one of our Full Time Students. Meet the other students, and get to know the teachers at Tri City. Train with our Full Time Students and the Senior Instruction team. On the weekend you will travel with our Golf Team and take part in a ranked junior golf event and experience our tournament preparation and post tournament evaluation program.